Asbestos is a naturally occurring mineral fibre. There are several types of asbestos fibres and they are normally identified in materials by means of specific sampling and laboratory testing. In the past asbestos was added to a variety of products to strengthen them and to provide heat insulation and chemical resistance. How can asbestos affect my health? Asbestosis, in which the lungs become scarred with fibrous tissue. The risk of lung cancer and Mesothelioma increases with the number of fibres inhaled. The risk of developing lung cancer from inhaling asbestos fibres is also increased if you smoke. People who get asbestosis have usually been exposed to high levels of asbestos over a significant period of time. The symptoms of these diseases do not usually appear until about 20 to 30 years after the first exposure to asbestos. Most people exposed to small amounts of asbestos do not develop these health problems. However asbestos materials that are disturbed or broken may release asbestos fibres which can be inhaled into the lungs. Theses fibres can remain there for a long time, increasing the risk of disease. Asbestos materials that crumble easily when handled or that have been sawn, drilled, scraped, or sanded into a powder are more likely to create a health hazard. Where can I find asbestos and when can it be a problem? These materials may release asbestos fibres if damaged, repaired, or removed improperly. Soundproofing or Coating material sprayed on walls and ceilings. Loose, crumbly, or water–damaged material may release fibres. So will sanding, drilling or scraping the material. Insulating Board Materials. Used to form wall panels, ceiling tiles, firebreaks etc. Loose, crumbly, or water–damaged material may release fibres. So will sanding, drilling or scraping the material. Cement sheet, millboard and paper used as insulation around heating systems and as wall panels. Repairing or removing appliances may release asbestos fibres. So may cutting, tearing, sanding, drilling or sawing insulation. Thermoplastic floor tiles (vinyl asbestos, asphalt, and rubber), the backing on vinyl sheet flooring and adhesives used for installing floor tiles. Sanding tiles can release fibres. So may scraping or sanding the backing of sheet flooring during removal. Door gaskets in heating systems, wood stoves and coal stoves. Worn seals can release asbestos fibres during use. Asbestos cement roofing. These products are not likely to release asbestos fibres unless sawed, drilled or cut. Textured paints (ARTEX), patching and joint compounds for walls and ceilings. Sanding, scraping or drilling these surfaces may release asbestos. Other older household products such as fireproof gloves, stove–top pads, ironing board covers and certain hairdryers, automobile brake pads and linings, clutch facings and gaskets. What should be done about asbestos in the home? If you think asbestos may be in your home, don't panic! If the asbestos material is in good condition it is normally safe to leave it where it is. Generally, material in good condition will not release asbestos fibres and there is no danger unless fibres are released and inhaled into the lungs. Check the material regularly if you suspect it may contain asbestos. Don't touch it, but look for signs of wear or damage such as tears, abrasions or water damage. Damaged material may release asbestos fibres. This is particularly true if you disturb it by hitting, rubbing or handling it or if it is exposed to extreme vibration or air flow. Sometimes, the best way to deal with slightly damaged material is to limit access to the area and not touch or disturb it. Always consult with an asbestos removal specialist such as Schofield Construction if you believe you need to remove or dispose of asbestos materials or check with your local health, environmental or other appropriate officials to establish proper handling and disposal procedures. If asbestos material is more than slightly damaged, or if you are going to make changes in your home that might disturb it, repair or removal by a professional contractor will be needed. Before you have your house remodelled, find out whether asbestos materials are present by having an asbestos survey carried out. Where may asbestos hazards may be found in the home? Some roofing and panel materials are made of asbestos cement. Houses built between 1930 and 1970 may have asbestos as insulation. Asbestos may be present in textured paint and in patching compounds used on wall and ceiling joints. Internal walls and ceilings may be formed from insulating board materials. Older products such as stove–top pads may have some asbestos compounds. Walls and floors around boiler units may be protected with asbestos paper, millboard or cement sheets. Asbestos is found in some vinyl floor tiles, the backing on vinyl sheet flooring and adhesives. Hot water and heating systems may be coated with an asbestos material or covered with an asbestos blanket or tape. How to identify material's that contain asbestos? You cannot tell whether a material contains asbestos simply by looking at it, unless it is labelled. 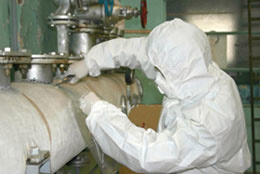 If in doubt, treat the material as if it contains asbestos or have it sampled and analysed by a qualified professional. Taking samples yourself is not recommended. Material that is in good condition and will not be disturbed should be left alone. Do keep activities to a minimum in any areas having damaged material that may contain asbestos. Do take every precaution to avoid damaging asbestos material. Do have removal and major repair done by people who are trained, qualified and licensed to work with asbestos. It is highly recommended that sampling and minor repair also be done by asbestos professionals. Don't use abrasive pads or brushes or power strippers to strip wax from asbestos flooring or its backing. Never use a power stripper on a dry floor. Don't sand or try to level asbestos flooring or its backing. When asbestos flooring needs replacing, install new floor covering over it, if possible. Don't track material that could contain asbestos through the house. If you cannot avoid walking through the area, have it cleaned with a wet mop. If the material is from a damaged area, or if a large area must be cleaned, call an asbestos professional. Company fined following unlicensed asbestos removal from primary schoolA construction company has been fined after it carried out unsafe and unlicensed asbestos removal during the refurbishment works in a junior school in Dursley. HSL: Asbestos ? Managing asbestos in domestic* and non-domestic premises ? Buxton, 5 Sept 2017This one-day course gives you the knowledge to manage asbestos in non-domestic premises to the standards required by Regulation 4 of the Control of Asbestos Regulations (CAR 2012). The course information is also applicable to the management of ‘domestic premises’, such as landlords’ duties for rented accommodation.